� In New York City in 2015, Hughes and Kelly Claes became the lowest seeded team (#16) to ever reach the semifinals of an AVP tournament. � In Chicago in 2017, Hughes and Kelly Claes became the youngest team to ever win an AVP title. Hughes was 22 1/2 years old while Claes was two weeks shy of turning 22. 2018: Hughes and Summer Ross played four AVP tournaments together, reaching the finals each time and winning twice. The pair won its first 14 matches to begin its domestic partnership. Hughes ranked eighth on the AVP in digs (5.36 per set). 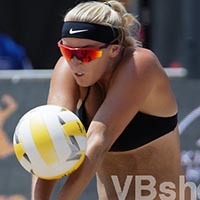 On the FIVB Tour Hughes played twice with Kelly Claes, finishing ninth both times. Hughes played 10 international events with Ross, winning a gold and a bronze in four-star events. 2017: Hughes and Claes competed in four AVP tournaments, winning in the season finale in Chicago. Hughes ended the year ranked eighth in hitting percentage (.444) and 10th in digs (5.36 per set). Internationally Hughes played once with Lauren Fendrick, then six times with Claes, getting a best of fifth place twice. 2016: Hughes and Claes played twice on the AVP Tour, advancing from the qualifier both times, placing third and then second. In San Francisco the duo became just the second team to reach a championship match on the AVP Tour after playing in the qualifier. On the FIVB Tour they played two events with a best of ninth. 2015: Hughes and Claes played in two AVP tournaments. In New York City, the duo advanced from the qualifier and despite losing in the first round, they advanced to the semifinals, placing third. They also finished ninth in the Manhattan Beach Open. Internationally the duo played once on the FIVB Tour, losing in the qualifier. 2014: Hughes played in three AVP events with three different partners, but did not advance from the qualifier in any of them. She and Kellie Woolever were fifth in the FIVB Under 23 World Championships in Poland, the she reunited with Claes to win a bronze in the FIVB Under 21 World Championships in Cyprus. 2013: Hughes and Kelly Claes won a bronze medal at the FIVB Under 19 World Championships in Portugal. 2012: Hughes and Wong-Orantes again finished ninth in the FIVB Under 19 World Championships in Cyprus. She paired with Summer Ross in the FIVB Under 21 World Championships in Canada, placing fourth. 2011: At age 16 Hughes and partner Justine Wong-Orantes placed ninth in the FIVB Under 19 World Championships in Croatia, the highest placement of a U.S. team at that event. She also competed in the FIVB Under 21 World Championships in Canada, playing with Caitlin Racich, but did not advance from the qualifier. College: Hughes competed in sand volleyball at Southern Cal after becoming the first high school player to declare that she will play sand volleyball exclusively in college. Her freshman season she won the AVCA National Championship with partner Kirby Burnham, finishing with a 42-4 match mark including 28 straight wins. Hughes was named AVCA All-American that season (2014). As a sophomore she again won the AVCA National Championship, playing with Kelly Claes. They finished 44-3, winning the last 25 matches of the season, and Hughes once against was named as an AVCA All-American. Hughes completed a perfect junior season, finishing 48-0 in matches and losing just one set with Claes. They won the National Championship again and for the third straight year Hughes as named AVCA All-American. Personal: Hughes comes from a volleyball family, as her older brother Connor was a two-time NCAA Champion outside hitter at UC Irvine, and her older sister Lauren played volleyball at Fairfield. She is the daughter of Rory and Laura, a former volleyball player as well. A four-year letterwinner at Mater Dei High School as a setter and right side hitter, Hughes was chosen first-team all-league three times. In 2012 she was the All-Orange County Player of the Year and a Volleyball Magazine High School All-American second team.